A better question is who doesn't?? I have been a fan of Kate DiCamillo since Mercy Watson to the Rescue first came out, and recently, I got a request for materials to go with the series. Of course, I could not wait to get started, and I had a blast creating the series bundle. All you need is hot buttered toast and you'll be set for fun. 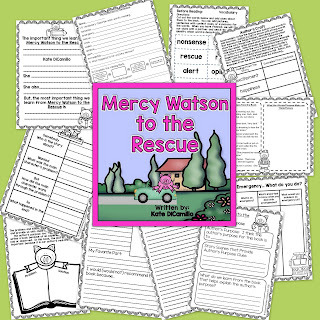 The first book, Mercy Watson to the Rescue has poor Mr. and Mrs Watson falling through the floor of their house. Can you visualize that? Add in Eugenia Lincoln's angry rants, and you've got one action packed set of adventures. 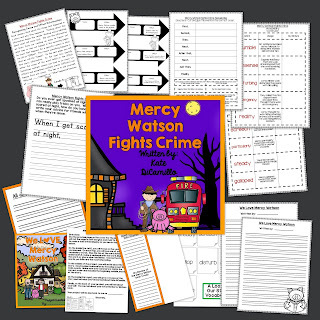 With this unit, your kids can work on comprehension strategies (visualizing, story elements, summarizing, author's craft) and have lots of writing experiences about handling emergencies. Well, Mercy's adventures do not end there. Book number two takes readers (and Mercy) on a wild ride (and has Eugenia furious once again!). In this books, students experience prereading about traveling, practice comprehension skills (point of view, sequencing, questioning and a few others), and write a class book about staying safe in the car. Who's gets scared at night? Ever think you're hearing noises? Just about every child does, and this book may help your kids work through some of those fears. 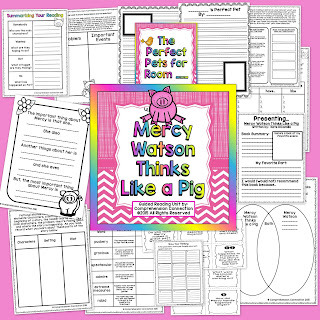 This unit includes cause and effect relationships, a sequencing project, vocabulary work., several writing options, and a lapbook. Each unit is different from the rest, and skills are varied. Who's ready for Halloween? Mercy is NOT! She is not interested in being a princess despite Mr. and Mrs. Watson's efforts. The only reason she's agreeable is because she's promised treats. (and Baby Lincoln has a bunch for her which again makes Eugenia's blood boil. Frank and Stella enter the series with this book, and it ends with Lorenzo, Ned, and Officer Tomilello sharing hot buttery toast with the Watsons after they save the Lincoln's cat who has climbed up a tree. This unit focuses on question types and the Halloween theme for great fun. Wow, I can't believe I'm already to book five. That's sort of how this series works since the stories are so animated, and the pictures are so vivid. Chris VanDusen is a master at making the perfect color choices for his illustrations to really make them pop. 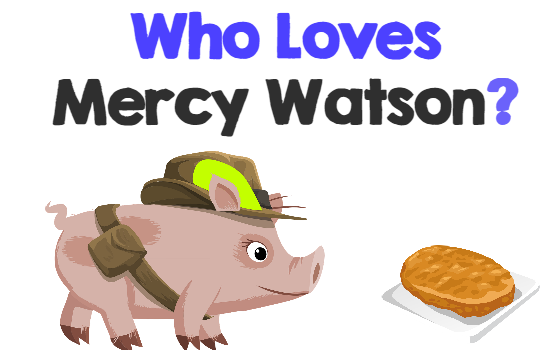 Book number five, Mercy Watson Thinks like a Pig is set in the spring as the Lincoln sisters get their gardens ready. Well, Mercy loves the taste and smell of pansies, so you can imagine what happens. 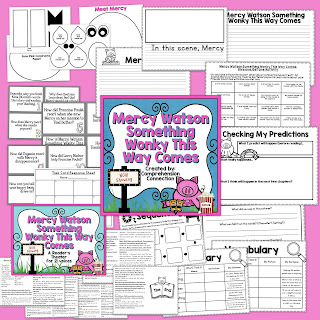 This unit offers themed writing about gardening, problem and solution, vocabulary, question task cards and recording form for Scoot, several writing options, and a class book about the perfect pet. Just look at the book's cover! Are you just ready to go buy the books? I hope so! It's such a bummer to reach the end of a series, and I have to say, I already miss working on them. I tried to make this last unit one my readers can not refuse by including a cute craftivity and reader's theater script for the whole class. All the teacher needs to do is pop the popcorn! Speaking of, that's the topic! Mercy's last adventure is at the Bijou Drive-in for the movie, When Pigs Fly. The whole town seems to be there and of course, it ends with hot buttered toast. I hope you and your readers have a great time with all of the activities I created, and if they do, can you please share your stories with me? I would love to hear the kids' comments. 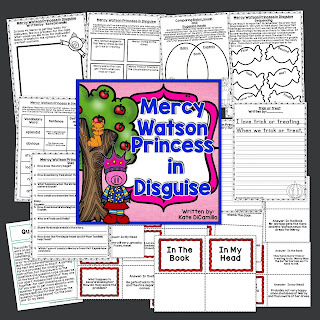 For the next 24 hours, the Mercy Watson bundle will be discounted to $15.00, a $9.00 savings ($2.50 per unit). To get your set, click on the image below. If you do not have copies of these books, but would like to use the materials. Never fear! Youtube is here. What other book series options do your kids love? Seems to me most have a few they read from beginning to end. I hope this will be one of them! Have a happy day and happy reading!